At what point is someone else responsible for car damage? While driving Princess and her friends somewhere, I hit an DEEP pothole, resulting in a flat tire. It was my first flat tire EVER! The good news is that I have emergency roadside assistance with my car insurance. Therefore, within 30 minutes a guy showed up to help me out. He quickly changed the flat for my donut and sent me on my way. Unfortunately, my donut was horrific to drive on. I am assuming it is defective. Thankfully, there was a 24 hour tire shop just a couple of miles down the road because we were almost 2 hours from home. A fantastic man was on duty who was very thorough. He checked my existing tire, showed me the damaged and that it was irreparable. Then proceeded to hunt through a dozen used tires to find me the best one he could. Talk about fantastic customer service, especially at 11pm on a freezing cold night! We got home safe and sound. But I was still worried about my tires, especially never having purchased a used tire before. And on top of that, my check engine light came on. And although I couldn’t tell/feel any amiss, it has been drilled into my head that when that light comes on, stop driving. Ugh!!! Thank goodness both of the twins have working cars now. And the check engine light turned out to the be the result of an improperly seated gas cap. Holy cow, way to scare a girl, car manufacturers! So the car is good to go, tires should get me through the end of the year (based on mileage) and my peace of mind has been restored! I am grateful for my emergency roadside assistance. I’ve had to use it twice in the last 6 months. Once when Gymnast locked the keys in the trunk at a rest area in August and then for this flat tire. Do you have roadside assistance? Do you have road hazard under your car insurance? Hope says right in her post that she does. Yes, that’s what I used and I appreciate the security it gives me so much. Such a mental weight off! 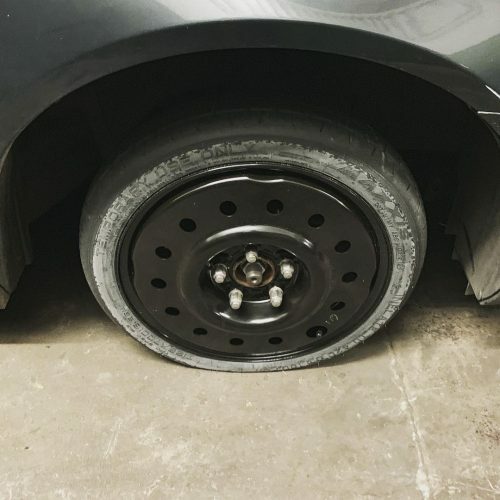 Hope I don’t know about where you live, but where I live if you get a flat because of a pot hole, the city will reimburse you for the cost of repair. We just have to submit our info and the receipts to them. Might be worth the call to see if you can get reimbursed for the tire. Hmm, that’s a great idea. I will check with the city I was in. How are you doing on saving for car maintenance? I remember your budget only alotted $30 for this. Yes, at $30 per month, $360 a year, I think I’m set for this year. The used car only cost me $45. And now I have a local mechanic who I trust and is very fair in his pricing so that is helpful. Crossing my fingers that I’m right about this. My car just hit 100,000 miles on it. So I’m sure in the next few years there will be some things I need to do. Wow you’re lucky you could get a used tire. I’ve always been stuck replacing mine in pairs or all four at once with new. Id like to point out that a lot of credit cards have roadside assistance in their benefits package. Ive used mine to change out a flat before and it also covers some towing distance.Check credit cards and physically mark the one that has it so you know when you need it. Then you can cancel roadside coverage on your car insurance or AAA. The way that Hope uses credit cards and with her history of debt, I don’t think it’s a good idea to have anything like this at ties her to a card. The amount that an insurance company charges for roadside is usually about $5/6months, which is probably less than the fees/interest being accrued on a credit card. That really makes no sense…. I didn’t say people should go out and apply for a credit card in order to get the benefit. 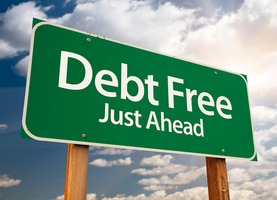 But most people have a credit card already and may have this benefit and not even known it. Doesn’t matter if you use the card or not. Why pay again via car insurance or AAA for something you may already have? It’d be safer to pay off the card, stop paying all the fees and interest, and stop all access to the high interest account. I owned a car that had the unfortunate feature of the mileage triggering the check engine light when it was due for an oil change. Every 3,000 miles, after an oil change, there it was. Freaked me out the first time. This is why I love the google. There are a lot of helpful car enthusiasts out there who identify car issues and post about them. By searching, I’ve usually found answers. It has been extremely helpful to go into an auto repair shop feeling pretty confident about knowing what the problem is. Yes, my recent cars have done that too. I was happy to figure that out on my own as well.